When muscle tissue experiences trauma or disease, such as muscular dystrophy, stem cells in the muscle known as "satellite cells" respond to repair and regenerate the muscle. These cells are particularly important in neuromuscular diseases, such as muscular dystrophy, which affect muscle stability and repair. 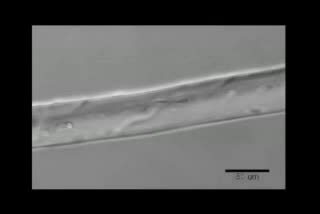 Now, University of Missouri researchers have used time-lapse photography to document satellite cell movements and behaviors when they interact with their 'host' myofiber. Scientists hope that if they can understand more about what satellite cells do in healthy muscle, obstacles to cell or gene therapies for muscular dystrophy might be overcome. "We have been trying to understand what's happening in these cells using the technology we have, which basically lets us take one snap shot per cell," said Dawn Cornelison, assistant professor of biological sciences in the College of Arts and Science and investigator in the Bond Life Sciences Center. "That's like taking one picture per game of a series of different football games and trying to use them to figure out the rules of football. This new technology is like watching the football game on TV. Now, we can see what's going on with groups of cells over time, how they move, how they're related and what kinds of different things they do. We were really surprised by a lot of things we saw because we never expected them to act that way." Satellite cells are small and rare, and only become active in specific conditions associated with damage or disease. Once activated, they multiply, establishing a large population of replacement cells in the muscle tissue, then differentiate to replace or repair damaged muscle. Patients with Duchenne's Muscular Dystrophy have muscle fibers so fragile that simply moving or breathing causes them to tear. While the satellite cells do a good job repairing this damage in early childhood, the cells eventually fall behind. Because this is a genetic disease, the new muscle made from the satellite cells has the same defect, so even the repaired muscle doesn't last long. Without repair, the muscles in these patients eventually stop working. In the severest form, this disease is fatal by early adulthood. "Previous studies had little data about how satellite cells moved, and many scientists thought that satellite cells didn't move," Cornelison said. "The time-lapse videomicroscopy showed that they can and do move. Some cells travel a few centimeters in a day. Now, we can ask things like 'is it important for them to be able to move? ', 'where are they going? ', 'what factors do they need to tell them where and how to move?' and 'what are the cells saying to each other?' Hopefully, the answers to these questions will help us think of ways to improve satellite cell therapies. For example, it would be wonderful if we could just tell all the cells in a transplant to move away from where they were injected, so they wouldn't be overcrowded and die." More information: The study, "3D Time-lapse Analysis of Muscle Satellite Cell Motility," was published in Stem Cells.